Back in 1970, exciting things were happening in Leycett. The Hollywood Music Festival took place in Lower Farm in Newcastle Under Lyme, and it was one of the single most important events that happened in the area. Between the 23rd and 24th May 100 acres of luscious countryside were transformed into a musical haven for rockers. 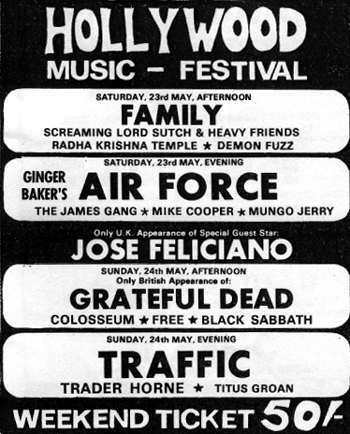 The event had some top names on the bill including Black Sabbath, Free, Traffic, the late John Peel as the festival DJ, and the first ever British appearance of the Grateful Dead along with a wildly successful performance of Mungo Jerry. The festival not only sparked their career but also raised them from a non-entity to instant fame. In fact their first single ‘In The Summertime’ was so successful that they didn’t want to overshadow their set and refused to play the single, leaving the DJ to play their track after they’d finished their set. An estimated 45,000 people flocked to the event, mostly because on the Sunday there were hopes for an all-star ‘session’ involving Eric Clapton along with the debut of Peter Green since splitting from Fleetwood Mac. Unfortunately the jam did not take place, namely because none of the acts billed turned up, which was typical of the free spirit celebrated at the time. Police were replaced by Hells Angels, which were probably much more equipped to deal with the revelers. However, not much trouble was reported, only some missing electricians tools and an awry sleeping bag, and if you thought touts were a recent plague amongst the music scene, it seems not. Over 750 tickets were stolen from Keele’s Student Union, so an ‘army’ of 75 students were deployed to not only be on the look out for the stolen tickets, but also to guard the stage area from any possible invasions. Another unusual addition to the weekend’s events was the Reverend Eric Stopford, the vicar of Madeley. He was quoted as saying ‘I’m mixing business with pleasure this weekend,’ as he apparently spent time watching the acts when he wasn’t offering advice to the fans. Among the many attractions the event had to offer, there was an all night discotheque, group drama, stalls, boutiques, bars, food, films in special tents, including Andy Warhols ‘Chelsea Girls’ and ‘Dirty Work’ with Laurel and Hardy, along with lectures and poetry readings. Many people chose to sleep in the marques over night or sharing tents with each other, fully embracing the spirit of altogether ness. All in all the festival was a great success. It proved that Staffordshire can be a haven of great entertainment, and can pave the way for future events in the area. Stoke Gigs would like to thank http://www.ukrockfestivals.com/Holly-fest-menu.70.html for their wealth of information on the festival. Visual Search Engine Visit RefZip, a visual search engine that displays web pages instead of text search results. If you'd like to support Stoke Gigs then feel free to buy us a coffee or two.... All contributions are non returnable and a GIFT to Stoke Gigs. Enter your email address to subscribe to Stoke Gigs and receive notifications of new posts by email. Local? Want to display your talents for free? Email us on stokegigs@hotmail.com to get a link badge below. Please note, Stoke Gigs is not responsible for content from external websites. Please use your discretion when clicking on links or external information.